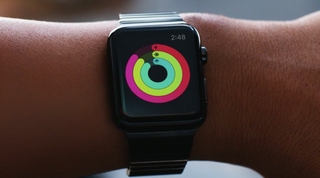 The Apple Watch wants you to work up a sweat. Apple's newest gadget is a pedometer and a heart-rate monitor, and it comes with a robust array of fitness tracking features, including three separate rings to track your movement. The Move ring will tell you if you've done a normal amount of brisk human activity for the day, while the Exercise ring will let you know when you've completed a workout. The Stand ring will measure how long you stand during the day and will doubtless make bloggers feel extremely bad about themselves. The Watch will give you customized reminders to reach fitness goals, and comes with its own dedicated Workout app, which can measure calories, time spent sweating, and a variety of other rubrics. It will be able to tell if you're running or biking. It will be able to gently chide you for doing so more slowly than you planned. It will share that data with the HealthKit app. You can also buy a Sport version, which comes with an alloy case that's 60 percent stronger than the regular version. Unfortunately, it doesn't have a waterproof version, so no taking the Apple Watch into the pool for lap swim. I wonder if Fitbit execs have started biting their nails yet. The Apple Watch looks like it's going to be a serious contender in the fitness tracking market, though the steep pricing may make other fitness trackers more appealing for people who don't want emoji-sending, Apple Pay, or any of the Apple Watch's other features.